Starting to work for Movitel from January 2012 as a house helper since the company opened stores in the district of Namialo, Antonio was highly appreciated by the district director of Namialo – Mr. Khanh, who hired him due to his enthusiasm, hard work and loyalty. Khanh had an intention to train him to be a store staff as working in the house, Antonio could capture all daily operations of the store, knowing where and how to store the merchandise, and understanding the work of each staff. After some time, noticing the extremely agile and quick understanding of the “house helper”, Director Khanh assigned Antonio to manage a mobile sales team. Every morning, after a decent cleaning the entire store, from 8am, Antonio led the team to go out selling goods in remote areas. Until September 2012, Antonio was promoted as a salesman of the shop; however, he still took care of the house cleaning at the same time. But from that time on, Antonio's work expanded. In addition to leading mobile teams, he was also in charge of managing and delivery goods to points of sale. Step by step, Antonio had gained experience and raised up his dream of changing life until it coming true in February 2014, when he officially took over Mr.Khanh’s position as the director of the Ilha island. He is now a “real boss”, managing the entire business of the district center with 9 staffs and 01 technical team. So far, Ilha district ranks the second highest in term of mobile penetration in the branch with 21.5% (11 237 subscribers out of 52 202 people). The story of Antoino is one among many other interesting stories in Movitel about the changes it brings to the staffs and people where it runs business. After 2 years entering Mozambique’s telecom market, Movitel has achieved significant successful business and with a rapid revenue and subscriber growth rate over 120%/year to reach nearly US$155 revenue and 5 million subscribers in 2013, making up 32% market share. However, what people impressed most by this operator is its contribution to the society. Movitel has popularized telecom services in rural and underserved areas, significantly changing the communication landscape in Mozambique and contributing in various ways to enhance life of people here through many of its social programs. In order to enable telecom services including mobile, fixed phone and Internet accessible to rural population, Movitel has invested in a network of 2,800 towers, 25,000km fiber optic cable covering 100% districts and highways, 80% population and a distribution channel to every village. Besides, it also provides service support and social programs including free Internet to schools, subsidizing handset cost for rural users, offering special package designed to support low-income users such as farmers or students. 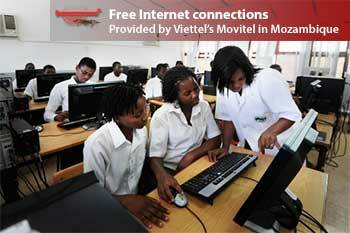 Movitel has provided free Internet to 2,500 schools, supported Mozambican government to implement e-government program. Nearly 600,000 people in at least 5rural districts have been covered and served telecom services for the first time in life. With Movitel, telecom services are now available to everyone, giving them opportunities to improve their living standard. With a philosophy of integrating business development with social responsibility, Movitel has considerably took part in the sustainable development Mozambique and helped changing the life of people here, particularly the poor and the rural population. It has generated nearly 20,000 jobs in rural areas. After employing local people, the company will train them until they can independently handle the work themselves. After that, expert managers from headquarter shall be retreated, leaving the positions for the local people to take over. By doing this way, Movitel not only gives the people a means of living but also a dream to pursue. Antonio - District Director of Ilha de Mozambique is one such person. *Author: Dang Phuong – Reporter of Youth Newspapers – Vietnam. SES S.A. announces that the SES-8 satellite was successfully launched into space at 17:41 EST (23:41 CET) from the Kennedy Space Center at Cape Canaveral. 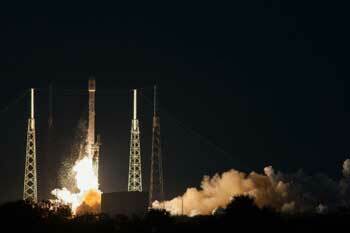 A Falcon 9 booster operated by SpaceX successfully injected the SES-8 satellite into geostationary transfer orbit, 31 minutes after lift-off, in what was SES’s maiden use of a SpaceX/Falcon 9 rocket. SES has three more SpaceX/Falcon 9 boosters under contract. SES-8 was manufactured by Orbital Sciences Corporation. The satellite features up to 33 Ku-band transponders (36 MHz equivalent). SES-8 is authorized by The Netherlands and will be co-located with NSS-6 at the orbital location of 95 degrees East to provide growth capacity over Asia-Pacific. The spacecraft’s high performance beams will support the rapidly growing markets in South Asia and Indo-China, as well as provide expansion capacity for DTH, VSAT and government applications. AT4 wireless, the most complete laboratory in wireless & cellular testing & certification, has appointed Swift Labs, an expert company in wireless R&D, functional testing, pre-testing and consultancy services, as its Canadian Agency. Arriving in Mozambique when the telecom infrastructure was very limited and only 35% of the population was accessible to the telecommunication services, Viettel – the Vietnamese leading telecommunications - has endorsed an initiative to popularize telecom services in rural and under-served areas in Mozambique. This initiative regards telecom provision as a commodity, which should be accessible regardless of geographical location or financial capacity. The company has invested in a network, service support and introduction of social programs to enable telecom services accessible to rural Mozambicans, as part of improving their overall lives and become its customers. Viettel aims at a sustainable social development and benefit both customers and the company by bringing mobile phones to every Mozambican and broadband Internet to every Mozambican family. Two years after the initiative was implemented, Movitel – the joint venture between Viettel and Mozambique’s SPI Company has built 2,800 2G/3G base stations and 25,000 km of fiber optical cables covering 100% of districts and highways, serving nearly 80% of the Mozambican population. In rural areas, by the end of 2013 the company has increased its coverage area from 60% to 85% and doubled the number of covered people from 35% to 75%. In addition, to address the difficulties incurred due to limited transportation infrastructure, Movitel developed a diversified distribution channels comprising of 153 shops, 12,600 agents and points of sales and nearly 4,000 direct sales staffs to deliver door-to-door services in every village. Nearly 600,000 people in at least 5rural districts have been covered and served telecom services for the first time in life. Tariff plans have been tailored to be affordable and flexible for different groups. For instance, farmers were offered zero entrant fee with top up denomination of any value in addition to subsidizing handsets while the youth could enjoy services such as i-Muzik, Missed call alerts, Call me back, daily news, horoscopes, etc. Never before is it easier for Mozambican to use telecommunications services than it is now with Movitel. Moreover, Movitel is considerably contributing to changing the information communication landscape in Mozambique thanks to its strong network infrastructure. Movitel now accounts for 70% of the country’s fiber optical cable infrastructure and 50% of the mobile phone network infrastructure, bringing Mozambique among the top three nations in terms of fiber optical cabling infrastructure in Sub-Saharan Africa (along with South Africa and Nigeria). The country now has a strong and modern infrastructure through this, in addition to the latest DWDM technology and 20Gbps bandwidth. The infrastructure enables Mozambique’s telecommunication industry to implement the e-government and develop ICT applications in the education and healthcare sectors for socio-economic. Especially, considering investment in education as an investment for the future and the knowledge base of a country, Movitel has introduced “Internet connection to schools” program to supply free broadband Internet to 4,200 schools nationwide. Up to the end of 2013, 2,500 schools was connected with Internet, helping millions of teachers and students have access to the world’s sources of information for a better education. Besides, the company also supports Mozambican government to implement e-government program to bridge the digital gap between rural and urban areas. Recently, Movitel, SA has become the only telecom operator in Africa in 3 consecutive years winning reputable prizes from prestigious international organizations by winning the Best Mobile Innovation Award – the most notable prize among the 18 others of the Mobile Innovations Awards. Author: Nguyen Thai Khang – Head of ICT division - ICTNews (www.ictnews.vn), Chairman of The Vietnam ICT Press Club.